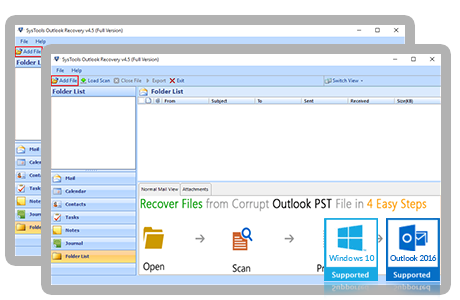 Outlook PST Repair Tool is a useful software to repair corrupt PST file / BAK File of ANSI and UNICODE type and restore mailbox data as PST / EML / MSG / HTML / PDF. Therefore in the event of a PST file getting corrupted due to any one or more of the above-mentioned reasons it becomes a necessity to repair corrupt PST files using an efficient third party tool. As SCANPST provided by Microsoft is not capable of dealing with corrupt PST files properly, one can make use of the Outlook Repair Tool which helps to proficiently repair corrupt Outlook PST within a short time. The Outlook Repair software is designed to solve all the users PST file corruption related problems comprehensively. Its wide range of features allows users to scan contents of corrupt PST and repair the damage. There is also an added facility to export recovered data into a variety of different file formats such as EML, MSG or PST. Software helps the users to transfer their data such as emails, contacts, tasks, calendars to various popular formats such as EML, PDF, HTML, PST, & MSG. This helps in order to shift between different email client applications without any loss of data while the tool acts to repair corrupt Outlook PST file. There is an added facility given within the software to divide very large size Outlook PST files into smaller manageable parts. Thus, Outlook Repair software allows users to decide the size of the multiple PST files created from a single large file during the process to repair corrupt PST file. Outlook Repair Tool possesses the feature to filter & show emails in the order of receipt. It can be done by specifying a date range and emails belonging to that duration will get exported to EML, PDF, HTML, MSG or PST format after you repair corrupt Outlook PST files. This feature helps to avoid wastage of time. When the software completes the process to repair corrupt PST files, the arrangement of folders in the output PST is the same as that of the corrupted PST at the start. This is of great help to the users as they can easily locate their emails, contacts, calendars, tasks in the newly created file. There is no modification to the formatting of the various data objects contained within the corrupt Outlook PST file which is to be repaired. Along with this, the meta information associated with all the data items in the .pst file is also preserved. Outlook PST Repair Tool is capable of generating a preview of all the emails within the PST file along with their attachments. Other items can also be previewed before the process to repair corrupt PST file contents is initiated. This capability of the tool is present in the free demo version. Presence of Dual repair Modes makes the software capable of handling major as well as minor cases of corruption. There are two types of scan modes - Normal Mode and Advanced Mode which help in dealing with both high and low levels of corruption in files to repair corrupt Outlook PST. For better understanding and improved user experience, the User Interface of the Outlook PST Repair Tool has been based on MS Outlook client interface. This makes it much easier to navigate through the different options present in the software. A CSV file gets automatically generated after the tool completes the process to repair corrupt PST file and export of recovered data items. This CSV file contains information such as the number of items exported from the Outlook PST and can be saved for reference purpose. Browse the file on your system to repair corrupt PST file, if the items are permanently deleted from the file then select Advanced Scan option for scanning data and then click on Add file button. Now the software shows the preview of data items along with attachments, select the desired one which you wish to export by using checking/unchecking the box. An Export window will get opened. Select the file format in which you want to save data i.e. PST, MSG or EML. Browse path to save output data at the desired location and click on Export. The process to repair corrupt PST file will get completed. Outlook Repair software is present as a free trial version to comprehensively repair corrupt PST files which have been damaged due to any reasons. This demo version of the tool can easily handle multiple PST files and remove any level of corruption from them. It can also export the data retrieved to several popular email client application formats like the EML, PST, MSG & also Office 365. Demo version gives limited facilities to the user and can repair only 25 data items per folder of corrupt PST file. For getting the full range of services it is advised to opt for the Licensed version which is quoted at a reasonable price. Is it possible to repair corrupt ANSI PST using this Tool? Yes, you can easily repair corrupt PST file of ANSI type from your Outlook 2002 client and export it into various formats as the tool supports both UNICODE and ANSI PST. Why am I getting the error "The file pstname.pst cannot be found". Will this tool help to remove this error? Yes, the Outlook Repair software can help to remove this error as it is resulting from corruption of PST file. You can use this Tool for easily removing corruption from files and accessing them conveniently. I have an extremely large number of PST files that I need to repair. Can I do it through this tool without investing much time? Yes, this software supports the feature to repair corrupt Outlook PST files in Bulk and does not require large amounts of time to be wasted for this purpose. Will I be able to recover my email attachments from corrupt PST files? Yes, the Outlook PST Repair software ensures that email messages are retrieved along with their attachments from damaged files after you repair corrupt PST files / BAK files. Is it mandatory to have MS Outlook installed for using this software? No, you do not need to install or configure MS Outlook on your system as the Outlook Repair Tool works independently to repair corrupt PST file and BAK file efficiently. I was searching for a method to repair corrupt PST file, extract important information & export it to EML as I wanted to switch to Thunderbird but I could'nt find a suitable solution. One day, while surfing the Internet I came to know about the Outlook Repair software and I used it to repair corrupt PST file. I couldn't have asked for a more efficient solution to my problems. Thank you so much! A deadly virus attack nearly destroyed all of the confidential data from my password protected PST files. In such a time of crisis, the Outlook PST Repair Tool proved to be the most technologically sound utility as it helped me to effortlessly repair locked PST files / BAK files and export data to a different email file format. I am highly grateful to the developers of this amazing utility. I have used a lot of Outlook recovery related third-party tools but the Outlook Repair Tool supercedes all of them in terms of speed, efficiency, accuracy and ease of use to repair corrupt Outlook PST files. The best thing about this software is that it is designed to resemble Microsoft Outlook interface, which greatly increases its familiarity among users.